Select a Department14310 N Dale Mabry Hwy3615 W. Hamilton Ave.
Dr. Yvonne Santiago is a bilingual, board-certified internal medicine physician with over 20 years practicing medicine in the Tampa Bay area. She is passionate about helping her patients stay healthy and enjoy life and her special interests include preventive medicine, women’s health, hypertension, diabetes and weight management, and the treatment of acute and chronic diseases. 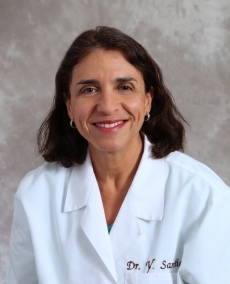 After earning her bachelor’s degree from Rutgers University in Newark, New Jersey, Dr. Santiago went on to earn her Medical Degree from Rutgers Medical School. She then completed her internship and residency in Primary Care and Internal Medicine at Yale New Haven Hospital in New Haven, Connecticut. She began her career in medicine as a Hospitalist in Connecticut and has been practicing in the Tampa area ever since.